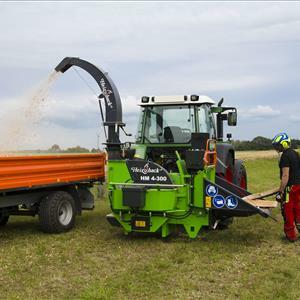 The JAPA 700 machine is a reliable firewood processor equipped with a TCT circular saw blade 700 mm in diameter. Irrespective of minor impurities, the TCT blade stays sharp for a long time. The splitting operation is launched by pulling the saw table to its rear position. This ensures reliable execution of the splitting movement. It is easy for the operator to adjust the splitting knife in accordance with the log size. Raising or lowering the knife requires just a light step on the pedal. As standard the machine is equipped with a knife that splits in 2/4 ways. Knives that split in 5 or even 6 ways are available as an option. The discharge conveyor is hydraulically driven and can be slewed mechanically into three different positions. This feature means the operation is reliable and proceeds smoothly; up to three bags can be filled without having to move the machine. The JAPA 700 model is available powered either by tractor or as a tractor/electrically-powered machine.